NEW CHAIN DESIGN WITH HARDNESS RATING OF 62-65 HRC! What Kind Of Chain Is This? This is a true security chain, made from square, case-hardened links to resist cutting. Laclede recently changed their heat treating process to make this chain 62-65 HRC. Made from quenched and tempered alloy steel with an electro-galvanized finish for corrosion protection. 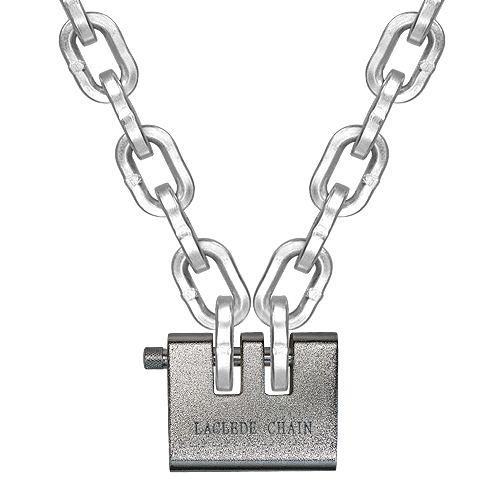 Laclede calls it "Lockdown Chain" for a good reason, and at 1/2" (13mm) in diameter, this is the biggest security chain we offer. Unless you simply do not want a big, beefy security chain, you really can't go wrong here. A true, high-security padlock made to work with square security chain. Its heavy-duty design will certainly be a deterrent to any potential thief. This beefy padlock weighs almost 2.5 lbs. You may not want to put it in your pocket, but you'll be happy to secure your precious equipment with it. The brass lock body is 3 mm thick and hardened to 50 HRC. The shackle / pin is 0.43" and is nickel-plated. 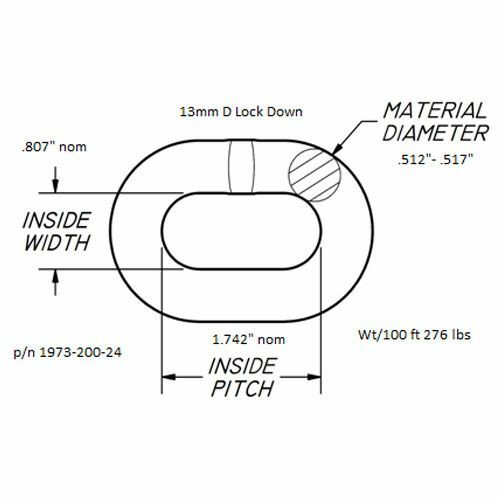 The lock also ships with three single sided keys designed to activate the 5-tumbler design, and the keyhole is protected with anti-drill steel. This lock works with 3/8", 7/16" and 1/2" security chain. * This product is not eligible for any current promotions.